Hello everyone! I’m here with Papertrey Ink Make It Monday #176: Backgrounds with Embossing Paste. It’s been a while since I’ve played along with them. So, I’m glad I had a chance to play today. Laura Bassen showed us how to use our dies to create stencils so that we could make pretty backgrounds using embossing paste. I’ve done this before so it was nice to do this technique again. 1. I used Papertrey Ink’s Stripes Horizontal Cover Plate to create my stencil. I just ran the cover plate through my big shot twice for some thickness. 2. One at a time I mixed my distress reinkers with Wendy Vecchi Embossing Paste. I mixed the paste and Mustard Seed Distress Ink and spread my paste on the top of my stencil thick. Then I mixed Peacock Feathers Distress Ink and spread it in the middle of the stencil, thick. The last I mixed Picked Raspberry and spread it on the bottom of my stencil, thick. 3. I lightly spread the paste upwards from the bottom to mix the colors going up. Once I removed all of the excess paste, I removed my stencil to reveal the colorful stripes. 4. I set my card panel to the side and die cut my middle Papertrey Ink Circle Scribbles Die out of Stampin’ Up! Vellum. 5. Then I die cut Lawn Fawn Scripty Thanks out of Basic Black Cardstock. 6. I adhered the vellum scribble to my striped card panel with Glossy Accents. I added my scripty thanks to the vellum scribble with Tombow Multipurpose Glue. 7. I rounded my corners with my We R Memory Keepers Corner Chomper (which by the way broke today, I’m so sad, I have to buy another one.). 8. The “thanks” looked to plain so I added Glossy Accents for a little shine. That’s how I created this card!! Oh by the way, my card size is 4-1/4 x 5-1/2 scored at 5-1/2. My card panel measures 4 x 5-1/4. So what do you think? Let me know. « I Love Back To School, Do You? Amazing!! You’ve done a fantastic job with the embossing paste and the colours are gorgeous. I’ve never used the paste before but now know who to ask for advice when I do, you certainly know what your doing. And love the glossy ‘thanks’, a perfect touch! Hey Shona!! Thank you so much for your wonderful comment. I love working with embossing paste. It really adds so much dimension to the cards. Yes, you have to try it. It’s so easy and yes, I will help you. Hey Toni!! Thank you so much for your kind words. Yes, I love how the glossy accents makes the word stand out. I want to add it on everything now, lol. I love the way you used glossy accents on the thanks word – makes it really stand out!! 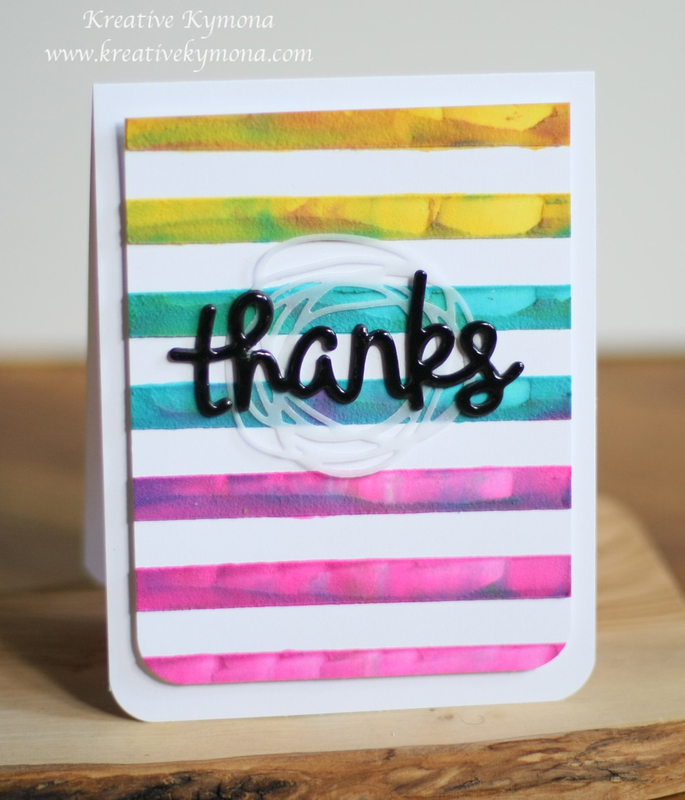 And the way you used reinkers and embossing paste is awesome – your background is gorgeous!!! Thank you for your kind comment about my card. The power line stencil was included in the book “Stencil Me In” by Marthe Le Van, published by Lark Books. I have to check that book out. Thank you so much for sharing. What a fun card! It just makes me smile! The colours are great and the glossy sentiment totally pops! Hey Natasha!! Thank you for your kind words. I love your color combo. I have to try those colors together. Kymona, whatever you did, it’s amazing! Those colors remind me of easter eggs when you drop oil in water to get tye die! Simply gorgeous! Hey Nancy!! Thank you so much for your wonderful comment. You are so right. The stripes do look like that, lol!! Beautiful! Love the cover plate choice and the glossy sentiment detailing! Hey Betty!! Thank you so much for your kind words. I didn’t have many PTI cover plate and I thought would be the easiest out of the two. I just learned about the glossy accents a couple of weeks ago and I can’t stop using it in this capacity. Hey Deepti!! Thank you so much for kind words. Love love love it.. The colors are perfect. Stunning – I love the colors! Awesome job! Hey Lizzie!!! Thank you so much for your kind words. I love your card too. I love your colors, the blue looks great with the purple. This turned out fabulous! I love your vivid colors so much! Hey Laura!! Thank you so much for your wonderful comment. I can’t believe that was your first video for Papertrey Ink. Your videos are always so lively and fun to watch. I hope you get to do more.